Italian Roots, Michigan Soil — a tagline so rich in winemaking history, it’s no wonder that St. Julian is one of Michigan’s powerhouse wineries. “Italian Roots, Michigan Soil” — a tagline so rich in winemaking history, it’s no wonder that St. Julian is one of Michigan’s powerhouse wineries. St. Julian Winery, the state’s oldest and most-awarded winery, was established in Windsor in 1921 during Prohibition. Rampant bootlegging across the Detroit River allowed Michiganders to enjoy the wines since the beginning. After the repeal of Prohibition, the winery relocated to Michigan, and today it thrives in southwest Michigan in Paw Paw. We chatted with third-generation owner David Braganini as he reflected on the accomplishments of his grandfather, Mariano Meconi — the “Italian roots” of the company. Meconi moved from Italy in 1908, held jobs with Studebaker and a railroad company, and found a way to transport grapes from California to sell to other Italians in the area. Too optimistic about the quantity of grapes one year, Mariano made wine from the excess to avoid wasting them, igniting his passion for winemaking. Braganini, who started at the winery in 1973, has carried on his grandfather’s spirit in the winemaking business and turned St. Julian into a booming enterprise. A solid reputation for sweeter whites, the primary style of wine made in Michigan before the 1950s, has aided the winery’s success. Today, you will still find sweet whites, such as the very popular Blue Heron, an inspiration from Braganini’s late father, Apollo, who spent 23 years at the winery. Incidentally, Blue Heron is the state’s top selling wine at 30,000 cases each year. Complementing St. Julian’s impressive list of more than 40 wines and spirits is a newer label called Braganini Reserve. These drier style wines are polished, elegant, and bursting with vibrant characteristics. We sampled the wines and found several favorites to add to our home cellars: Pinot Noir and Sauvignon Blanc (Sharon), and Cabernet Franc and Riesling (Lorri). Other varieties under the label include Traminette, Meritage, Chancellor Noir, Merlot, Syrah, Blanc de Blanc, Blanc de Noir, Late Harvest Riesling, Meritage, Pinot Gris, and Pinot Noir. St. Julian Winery has five tasting rooms around the state, making access to their wines easy: Paw Paw, South Haven, Union Pier, Frankenmuth and Dundee. 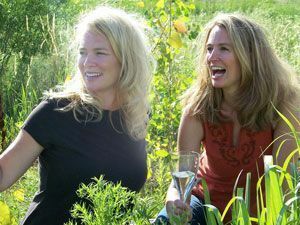 Lorri Hathaway and Sharon Kegerreis are authors of the award-winning From the Vine: Exploring Michigan Wineries and The History of Michigan Wines. 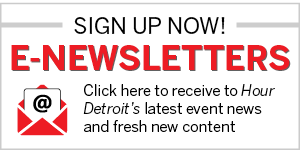 Learn more and get autographed books at deliciousmichigan.com.